A good website is essential to not only providing visitors with the information that they need about your company, but also to leaving a good first impression on your potential customers. Most people are naturally skeptical any time they venture onto a company website for the first time, which is why it's important that your website reflects positively on your business. 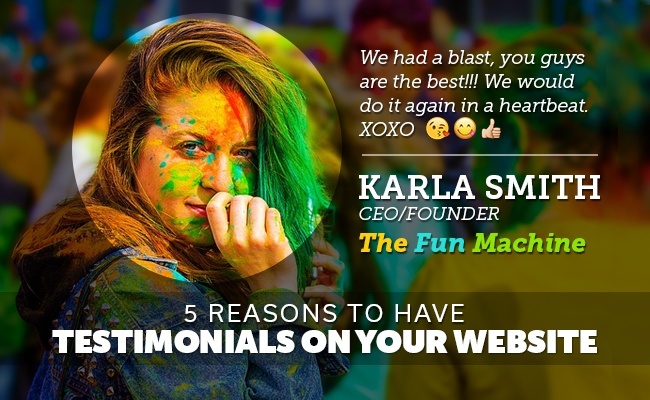 One way you can do this is by dedicating one of your web pages to customer testimonials. Simply having a customer testimonial section can be enough to earn the trust of your visitors. This is because, first and foremost, they are proof that you have customers and are therefore a legitimate business and not some sort of online scam. Secondly, testimonials are kind of like positive reviews from previous customers. The more testimonials you have, the more your visitors will assume that you must be a trustworthy company. People tend to trust other consumers over businesses, and for good reason. Few people will trust a business because they'll assume that their end goal is just to get their money. Customer testimonials work like referrals, convincing your visitors that they can rely on your business. Customer testimonials don't just help to position your company in a positive and reputable light, they are also effective in explaining how beneficial your product or service can be. A good customer testimonial will include what the customer's need was and how your product or service was the solution to that need. For example, if you're running a law firm, then in one testimonial, a customer might go into how they were injured in a car accident and needed legal assistance. They could then explain how by using your legal council, they were able to win their lawsuit and obtain a large settlement. A company's products and services may not always be self-explanatory. In fact, some products and services can be used in multiple ways. Visitors to your website can glean information on how your products or services can work from your customer testimonials. This is because your customers are likely to explain how they used your products or services to meet their needs. Take for example a product like a stain remover. Your customers can explain in their testimonials the different ways in which they were able to effectively use your stain remover, whether it was to remove a wine stain from their couch or to remove pet stains from their carpet. These are different examples of how the product can be used. It's a lot easier for visitors to connect with other customers than it is for them to connect with a CEO of a company. If they can relate to the customers in your testimonials, it will be easier for them to relate to your brand. Such an emotional connection can be a powerful tool when it comes to converting new customers. Be sure to use the names and pictures of the customers providing the testimonials to make it even easier for visitors to connect with them on an emotional level.